home’s construction was most likely placed in the front yard for the lawn. If your soil looks like the photo above, do not despair, any soil can be made into productive soil with a little work. If you are starting from scratch, the most important thing you can do to improve your soil is add organic matter. The process of soil improvement is not unlike any other process in that, given enough time and or money, anything can be accomplished. If you have more money than time, you can simply purchase the materials from the local garden center to accomplish the task quickly. If, on the other hand, you are like most of us, you have more time than money; you can take the slow but sure route to soil improvement. Another factor to consider is soil drainage. The clay soil that was graded by heavy equipment is usually in pretty bad shape from a gardener's perspective and it doesn't drain very well. 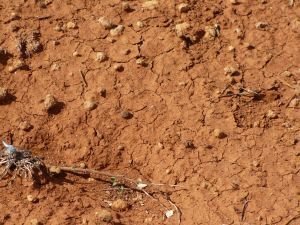 Soil improvement is the classic “which came first, the chicken or the egg?” scenario. When you are starting from scratch, you probably don’t have a lot of free organic matter lying around. And you probably don’t have a compost heap either. That pile of brush and weeds back along the property line might have been a feeble attempt to start one, but if there is any organic matter back there, it probably won’t go very far. Sources of free organic matter can be local farms or horse stables, your local municipal service center, county leaf recycling programs, etc. Some of the municipal programs allow residents to pick up the compost for free but you may have to pay to have these materials delivered. Farms and stables may be a little more inclined to give you free manure if you volunteer to clean out a stable or two in return for the material. Two of my favorites are my own grass clippings and leaves. We live in a suburban setting, but not in a “development” so we don’t have to compete with the neighbors for the greenest lawn using the most chemical fertilizer, weed killer, and water. Our lawn hasn’t had any maintenance other than patching the occasional spot and cutting for 25 years. The grass clippings are either used as mulch around plants and trees or composted and added to the garden. Leaves are my other favorites. We have a mix of Maple and Oak trees. The Maple leaves break down more readily than the oaks, so they are used more. If you run over them with the lawn mower, it helps them compost easier by chopping them up as well as incorporating grass clippings that add nitrogen to the leaves, which, by the time they fall to the ground are mostly carbonaceous material. Once you have established your garden areas, I also like to layer the leaves over the garden in the fall. I think that it helps to keep the soil warmer and keeps the worms happier. As any home gardener knows, there is never enough compost to go around, and we're no different. Whenever we need to have more than what the compost pile produces, we like to use Sweet Peet, both as a mulch and as a soil amendment. The best time of year to work on soil improvement by adding organic material to the garden is in the fall by incorporating it into the soil and letting nature do its thing. Organic material such as manure can vary greatly in it nutrient content and pH due to its age and the amount and type of bedding present. Leaves can take longer to breakdown because they lack nitrogen which feeds the bacteria that breaks organic matter down. A good balance of carbonaceous and nitrogen-rich materials is best. A little work, a lot of improvement! There are several ways to incorporate this material into your garden soil. The low cost, high physical activity way is, at its simplest, just spreading the material over the garden and turning the soil over. A step above that is to “double dig” the garden area. In order to do this, start at one end of the garden dig a trench about 12” wide and the depth of your spade across the width of the garden. Remove the soil and take it to the other end of the garden. Using the spade or a sturdy garden fork, loosen the soil in the bottom of the trench. Then, starting back towards the other end of the garden, take the top of the soil from the garden and fill in the trench that you just created, creating another trench. Repeat this process until you reach the other end of the garden and fill in the remaining trench with the soil that you kept from the first trench. An alternative to hand digging is to use a mechanical tiller to dig the soil. There are advantages and disadvantages to each way of digging. Hand digging can be done at any time when the soil is dry enough, and to me, digging is good thinking time as well as exercise. Tillers can also give you a lot of exercise; they can be unwieldy, noisy and can easily get away from you depending on the type and size of the machine. If you are going to rent or borrow a tiller, you have to make sure that the weather will be OK on the date you plan to use the tiller. Of course, if you have your own tiller, this is not a problem. If you plan to use a mechanical tiller, I would suggest renting one vs. buying one. The number of times each year that the average gardener needs a tiller does not make it cost effective to own a tiller, especially when it will sit idle 90% of the time, although on the plus side, it’s always there for you when you do need it. The bottom line is that any soil improvement that you do, especially by adding compost, will have a positive effect that will result in higher yields from your plants.